Once you have the basics of clustering sorted you may want to dig a little deeper than just the cluster labels returned to you. Fortunately the hdbscan library provides you with the facilities to do this. 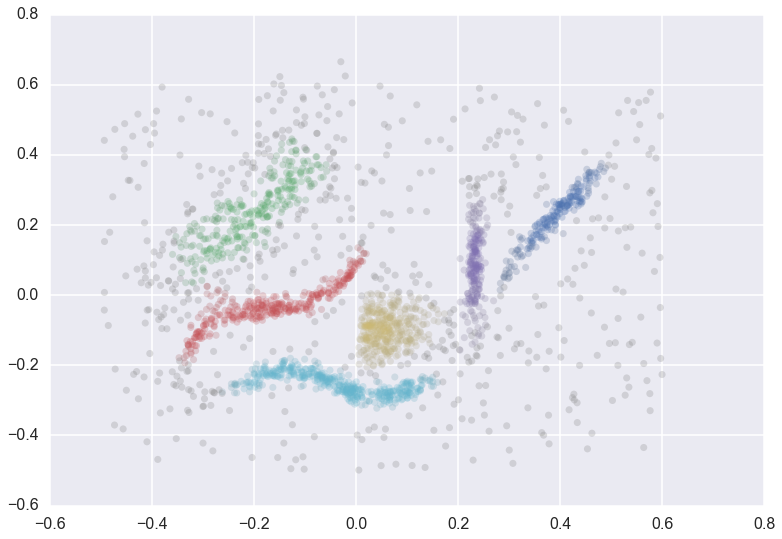 During processing HDBSCAN* builds a hierarchy of potential clusters, from which is extracts the flat clustering returned. It can be informative to look at that hierarchy, and potentially make use of the extra information contained therein. The question now is what does the cluster hierarchy look like – which clusters are near each other, or could perhaps be merged, and which are far apart. We can access the basic hierarchy via the condensed_tree_ attribute of the clusterer object. 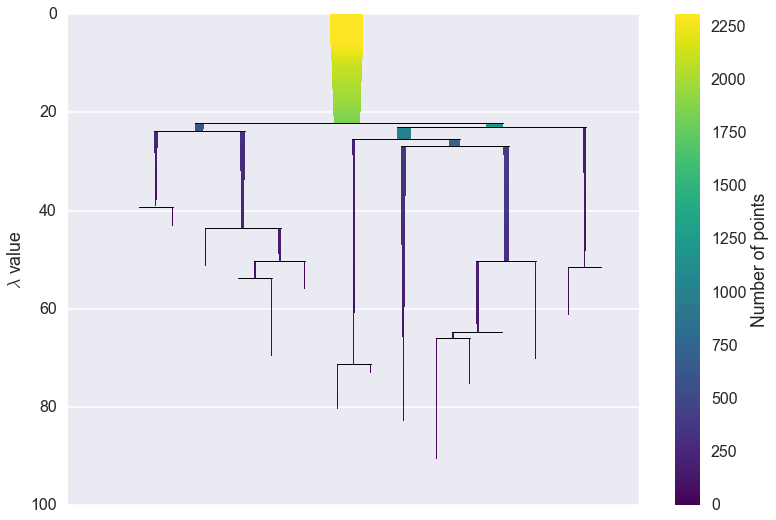 We can now see the hierarchy as a dendrogram, the width (and color) or each branch representing the number of points in the cluster at that level. If we wish to know which branches were selected by the HDBSCAN* algorithm we can pass select_clusters=True. You can even pass a selection palette to color the selections according to the cluster labelling. From this we can see, for example, that the yellow cluster, at the center of the plot, forms early (breaking off from the pale blue and purple clusters) and persists for a long time. By comparison the green cluster, which also forming early, quickly breaks apart and then vanishes altogether (shattering into clusters all smaller than the min_cluster_size of 15). You can also see that the pale blue cluster breaks apart into several subclusters that in turn persist for quite some time – so there is some interesting substructure to the pale blue cluster that is not present, for example, in the dark blue cluster. In this was a simple visual analysis of the condensed tree can tell you a lot more about the structure of your data. This is not all we can do with condensed trees however. For larger and more complex datasets the tree itself may be very complex, and it may be desireable to run more interesting analytics over the tree itself. This can be achieved via several converter methods: to_networkx, to_pandas, and to_numpy. The graph actually contains nodes for all the points falling out of clusters as well as the clusters themselves. Each node has an associated size attribute, and each edge has a weight of the lambda value at which that edge forms. This allows for much more interesting analyses. Here the parent denotes the id of the parent cluster, the child the id of the child cluster (or, if the child is a single data point rather than a cluster, the index in the dataset of that point), the lambda_val provides the lambda value at which the edge forms, and the child_size provides the number of points in the child cluster. As you can see the start of the dataframe has singleton points falling out of the root cluster, with each child_size equal to 1. This is equivalent to the pandas dataframe, but is in pure numpy and hence has no pandas dependencies if you do not wish to use pandas. We have still more data at our disposal however. As noted in the How HDBSCAN Works section, prior to providing a condensed tree the algorithm builds a complete dendrogram. We have access to this too via the single_linkage_tree attribute of the clusterer. Again we have an object which we can then query for relevant information. 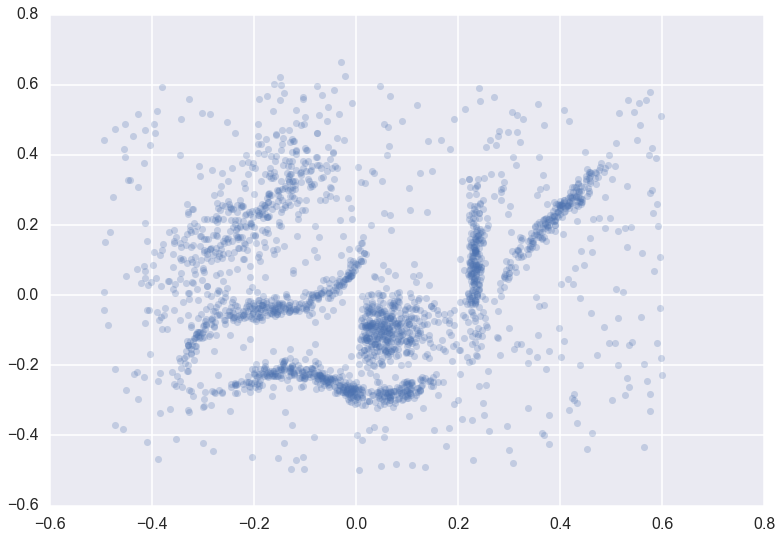 The most basic approach is the plot method, just like the condensed tree. As you can see we gain a lot from condensing the tree in terms of better presenting and summarising the data. 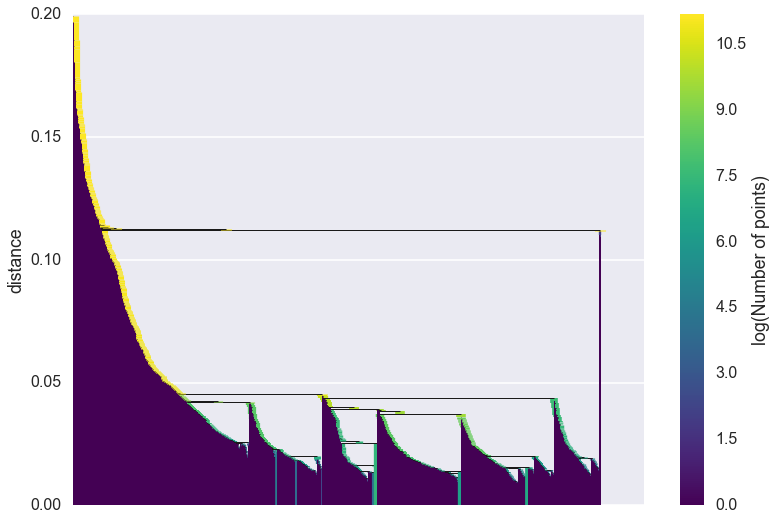 There is a lot less to be gained from visual inspection of a plot like this (and it only gets worse for larger datasets). The plot function support most of the same fucntionality as the dendrogram plotting from scipy.cluster.hierarchy, so you can view various truncations of th tree if necessary. In practice, however, you are more likely to be interested in access the raw data for further analysis. Again we have to_networkx, to_pandas and to_numpy. This time the to_networkx provides a direct networkx version of what you see above. The numpy and pandas results conform to the single linkage hierarchy format of scipy.cluster.hierarchy, and can be passed to routines there if necessary. © Copyright 2016, Leland McInnes, John Healy, Steve Astels. Revision 94f2c942.